The best that the North Shore has to offer! Introducing the Polygon Juniper Lynn Valley condos located in the prestigious Timber Court North Vancouver district. A limited collect of 1, 2 and 3 bedroom apartment residences that are inspired by Whistler architecture are coming soon to the sought after Lynn Valley district community. Here, homebuyers will find granite and timber detailing and floor plans that offer generous open concept living spaces plus sophisticated modern interior design details including smooth stone counters, wood style laminate floors and custom cabinetry coupled with stainless steel appliance sets. The new North Vancouver Juniper Lynn Valley condos at Timber Court community will also be situated ideally close to Lynn Valley shopping village that includes Brown’s restaurant, plus easy access to major transit/bike/driving routes and of course, the North Shore Mountains. The physical address of these new Lynn Valley apartments is at 2517 Mountain Highway North Vancouver. Other area highlights include the Capilano Suspension Bridge, Lynn Canyon, Mount Seymour, Lower Seymour Conservation Reserve, Deep Cove, Grouse Mountain and lots of boutique shops and restaurants. The Timber Court Lynn Valley Juniper condos in North Vancouver will also be situated close to the best North Shore public and private elementary and secondary schools in addition to Capilano University. For more details, please visit www.polyhomes.com today. The Juniper condo building is designed by award winning Raymond Letkeman Architects and features modern West Coast architecture with pitched roofs and wood beams. There will be thoughtful pedestrian pathways throughout the community plus a focal water feature located on 27th Street. The Lynn Valley Juniper apartment residences will feature a lobby with timber supported canopies, a welcoming fireplace and imported stone floors. Most of the ground level Juniper North Vancouver condos will have direct entry from the street through a fenced yard. The building will also feature a fitness studio, social lounge and underground parkade with security cameras and emergency buttons. Each suite at Juniper Timber Courts will feature heavy deadbolt locks and door views in addition to smoke detectors and fire sprinkler system. All homes come with the 2-5-10 year warranty plus the Polygon “New Generation” design and construction. Some of the optional upgrades available include a storage/bike locker, mini garage for outdoor equipment and additional parking stalls for sale. There’s even a dog wash station in the parkade. 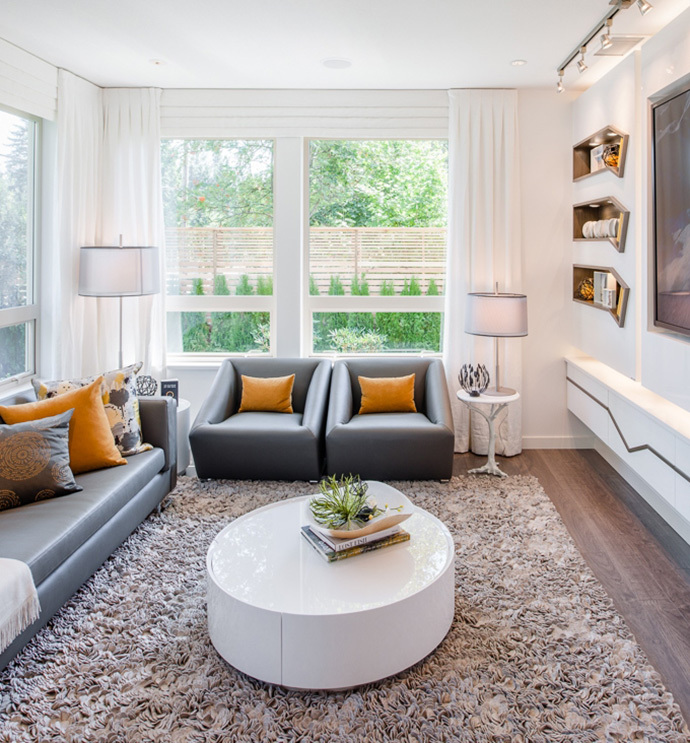 The contemporary condos at Lynn Valley Juniper apartments will feature flat panel stained wood entry doors with polished chrome hardware, hydronic in floor radiant heating, rich laminate floors and nine foot ceilings in the dining and living spaces. There are 2 designer selected colour schemes that are called Light and Dark and there are plush nylon carpets in the bedrooms. The presale North Vancouver condos at Juniper Lynn Valley also features horizontal blinds on windows for privacy in addition to low E double glazed thermally broken vinyl windows and large outdoor patios/balconies are per floor plan. The spa inspired bathrooms include imported design selected porcelain tiled floors, flat panel, square lined profile cabinets featuring polished chrome hardware and soft close mechanisms. Other bathroom features include custom cabinetry with stained wood veneer or glossy white, plus ensuites with luxurious oversized shower with frameless glass shower doors and rain shower head with built in toiletries niche and integrated bench seating in select homes. Other bathroom features at the Lynn Valley Juniper apartments in North Vancouver include contemporary vanity mirror with lighting, durable quartz counters with Grohe faucets and water conserving dual flush water closets with soft closing lids. The gourmet kitchens at the North Vancouver Juniper condos for sale include premium flat panel cabinetry in stained wood veneer or glossy white with soft closing hardware, elegant polished quartz stone counters and marble backsplashes in addition to a kitchen island in select homes. 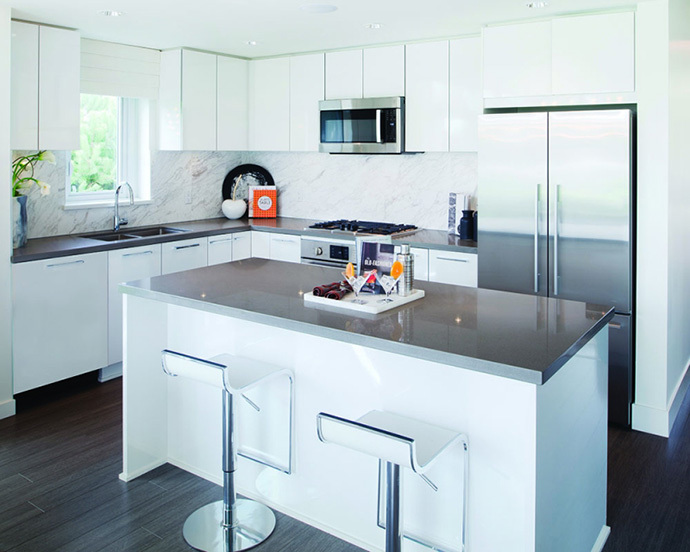 The homes will also feature sleek stainless steel appliances by Fisher & Paykel and KitchenAid plus contemporary recessed pot lights and under cabinetry lighting. Some homes have special cabinet features like a Lazy Susan. The floors are laminate and there are dual roll out recycling bin stations and undermount stainless steel sink. Additional thoughtful touches at the Juniper Timber Court Lynn Valley apartments include conveniently located TV outlets and telephone jacks, wiring for high-speed internet, washer/dryer included in every home and key fob access. Some of the draft layouts at Juniper Lynn Valley are out! The 1 bed/1 bath Plan A is approximately 695 square feet while the 1 bedroom plus den layout Plan B is approximately 760 square feet. The spacious 2 bed/2 bath Plan C floor plan is approximately 920 square feet while C1 is 920 square feet. The Lynn Valley Juniper Floorplan D is 2 bed/2 bath at 888 square footage while the 3 bedroom plus 2 bathroom Floor Plan E unit is approximately 1,135 square feet.